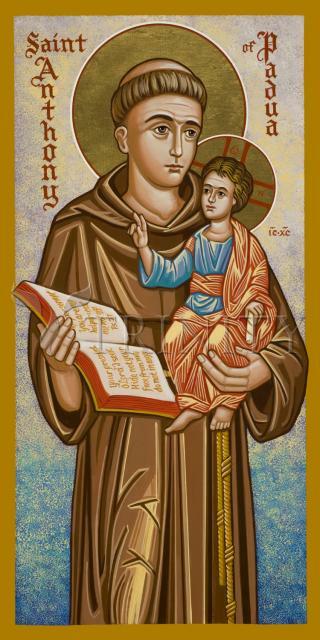 St. Anthony was born Fernando Martins in Lisbon, Portugal. He was born into a wealthy family and by the age of fifteen asked to be sent to the Abbey of Santa Cruz in Coimbra, the then capital of Portugal. During his time in the Abbey, he learned theology and Latin. When a novice decided to leave the hermitage, he stole Anthony's valuable book. When Anthony discovered it was missing, he prayed it would be found or returned to him. The thief did return the book and in an extra step returned to the Order as well. St. Anthony is venerated all over the world as the Patron Saint for lost articles, and is credited with many miracles involving lost people, lost things and even lost spiritual goods.